Sharing photos on your phone is great for portability; living with prints makes your house a home. In many ways, this is my favorite part of the process, and it starts with our initial consultation. I'll ask how you ideally want to enjoy your artwork, visit your space, invite you to touch samples, and pre-visualize with you the best sizes and arrangements. I've found some gorgeous handmade and archival options (shown below), though I've been known to hunt for frames at Homegoods if that's what serves you best. The 5x7" size is perfect on a desk, shelf or dresser. My favorite size is 8x8". My favorite cover is a vegan leather, shown here in willow green. 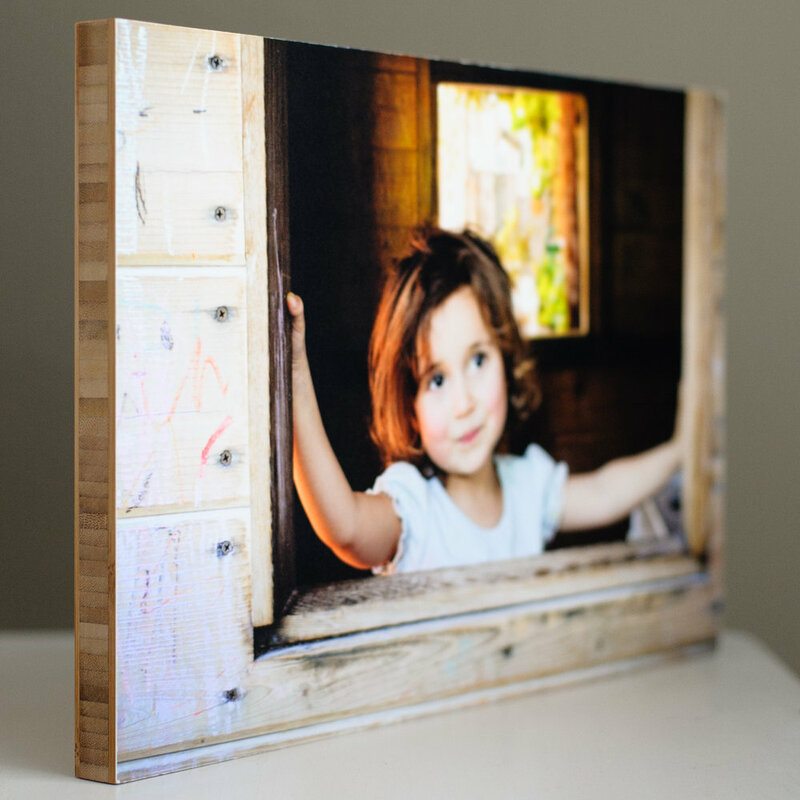 This is a print mounted onto a ready-to-hang bamboo panel. I love this method as alternative to traditional framing because it adds warmth and shows the print's true colors (rather than the textured effect of printing directly onto wood). This family took a mix-&-match approach with variations on black frames by a fantastic Etsy shop. And when it's time to put nails in the wall: I know a guy. Again, via Etsy -- a trio of photos in identical frames showcases a pair of fraternal twins in the hall outside their room.